Okay, okay, so I haven't quite kept up with my end of the VeganMoFo bargain, so to speak. Posting every, single, day was a pretty lofty goal (especially since I'm already 3 posts shy of blogging more during this month than I did during all of 2009 or 2010!). Plus, that whole MoFo schedule thing, well... it kinda went out the window, too! Thus, I'm back at square one, in a way. In my case, that means blogging about what ever inspires me when I finally sit down at 2:30am (with a cup of tea) to write for Veggie Terrain. It also means more recipes - hopefully - and more sporadic posting - sadly. That's just the way this blog is run, my dears. 1.) Pour chickpeas into a medium-sized bowl & lightly mash using a potato masher or fork. 2.) Add remaining ingredients & stir to combine. 3.) 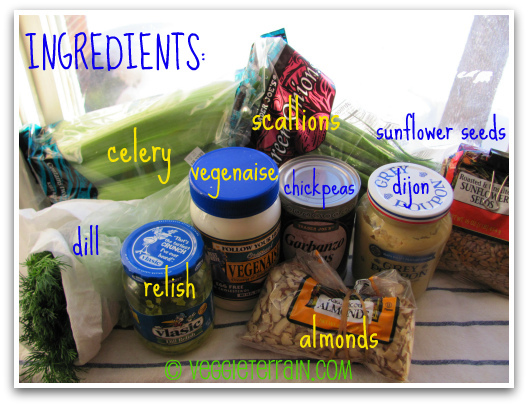 Taste, adding salt & pepper, & adjusting amounts of Vegenaise, relish, & mustard as desired. 4.) Serve on toasted wheat bread, topped with lettuce & tomato. Love the step by step pictures looks so great! I haven't tried a chickpea salad sandwich but have seen plenty of posts about them. Your looks delish and the ingredients sound like a good combination. I must try this soon as our weather is starting to warm up! I've made something like this before and was kind of "meh" about it, but your version looks Dee-Licious!!! 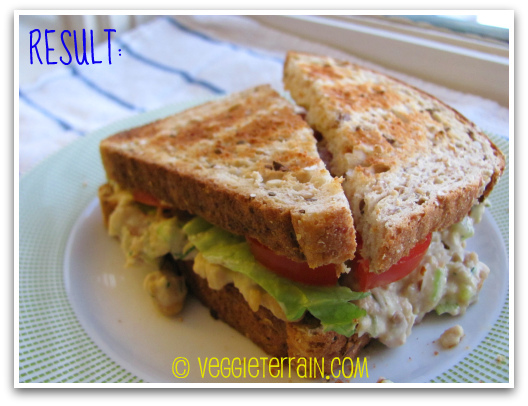 Man, I love a chickpea salad sandwich and your version looks perfect. Your photos are the best! Completely adorable. 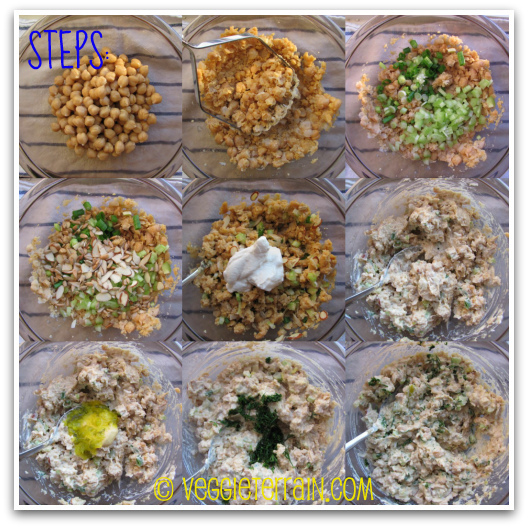 I love your photos and chickpea salad is one of my faves! Ah! This does look good - chickpeas, what would we do with out 'em!! Lovely recipe!! Just made this-it was DELICIOUS!! Will definitely make again. Yum.